Mizuma Art Gallery is delighted to announce the opening of Ken + Julia Yonetani’s solo exhibition “Wishes” on Wednesday 14th October 2015. Having represented Australia at the Venice Biennale in 2009, Ken Yonetani works with Julia Yonetani as a two-person artists’ unit, converting the influences of their nearby environs and current political issues into works filled with aesthetic and humour. The duo work largely overseas: at the beginning of this year with a solo exhibition at a French abbey, as well as group exhibitions in Germany, France and the UK, and with a solo exhibition planned for the year-end at the Australian National Museum. Ken + Julia Yonetani are taking their place as artists on the world stage, and their work invites ever greater expectations. This solo exhibition will be their first in Japan. For this show, the artists will present a body of work created upon the theme of nuclear power. The central piece will comprise an installation created from several chandeliers (Crystal Palace: The Great Exhibition of the Works of Industry of all Nuclear Nations), in which each chandelier is assigned the name of a country, and the size of the chandelier corresponds to the scale of that country’s nuclear power capacity. 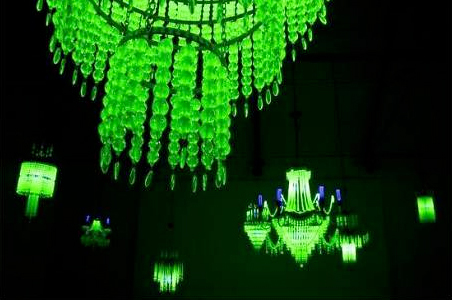 The chandeliers are produced using the now rarely-employed material of uranium glass, which when exposed to a UV black light emits a uniquely marvelous green light. In the work Three Wishes, the figure of the Disney character Tinkerbell rotates, enveloped in light, in time to the melody of the song ‘Small World’ played on the music box. In contrast to its charming exterior, this piece is fraught with the threat of nuclear power. It was created taking inspiration from the 1957 Disney animated tv program Our Friend the Atom. As we approach closer to the work, we realize that Tinkerbell’s wings are those of the Pale Grass Blue species of butterfly (yamato shijimi), the bodies of which are now frequently malformed due to the effect of radioactive contamination from the Fukushima Daiichi Nuclear Power Plant disaster . Disney created Our Friend The Atom for future generations. For Japan, too, which was in a period of high economic growth at that time, nuclear power was seen as a means by which to enrich our lives; it was presented as a sign of proof of the nation’s growth. By contrast, it has been through the lived personal experience of the Fukushima nuclear disaster that we have come to learn of the actual, shocking environmental destruction and human endangerment made possible by industrial and economic development policies utilizing nuclear power generation. Ken + Julia Yonetani’s works ask us to try to advance in progress towards our own future. We warmly welcome you to view these artists’ uniquely talented work. The eggs of yamato shijimi butterflies were collected in the town of Hironomachi in Fukushima prefecture and raised by the artists in their studio in Okinawa, in order to make use of the forms of the adult insects. They worked in cooperation with a research laboratory led by Professor Joji Otaki at the University of the Ryukyu, Okinawa, which is conducting a study on the biological effects of nuclear contamination.